But to take your larger point, not only can I admit that "Sugar Sugar" is a great song, I fully subscribe to your man Scott Miller's "Your ears are always right, the embarrassment is always wrong." I'm exasperated by the self-conscious groovebags who strike affected poses: wearing, eating, doing things "ironically." Guess what, Trucker Hat Dude, you're go-cart racing, listening to Kiss and eating fondue not because you're achingly arch, but because those things are fun. And if Trucker Hat Dude can't admit something is fun, then that's just sad. Miller's "originality isn't the be-all end-all" idea is borne out by the success of all the Chuck Berry/David Bowie/Madonna reincarnations out there. The fact that the son-of-son-ofs may be dupes of the mother dough doesn't diminish the pleasure of a great pop song. Or a great perfume, as obvious as its olfactory quotes may be. To paraphrase Miller, the nose is always right. For example, it took the appearance of Chanel No. 5 Eau Première for me to "get" Chanel No. 5. But Eau Première is still the version I want to wear. And Guerlain Mitsouko is too rich and uncompromising for me -- it's heartburn in my nose. But Attrape Coeur reworks some of Mitzy's ambered-peach act and makes Guerlain's history accessible for me. It's funny you should write to me about this, because coincidentally, I was just reading a thread on Basenotes where someone was complaining about Keiko Mecheri's perfumes. The person felt that many of her perfumes were simply variations on Serge Lutens' line. Even though they found her versions more accessible, the comment was: "I prefer the original for the respect of the creativity of an artist, even if it's a nicely done copy." I respect the creativity of an artist too, but sometimes I'm happier listening to Gary Numan than David Bowie, or the The Killers instead of The Cure. Fumies, keep on wearing -- and sharing -- your common pleasures. Read Part One here. I have a £3.99 bottle of Lidl Suddenly D'Or Lidl - for those not familiar with the chain - being a rock bottom, "merchandise straight from the cardboard outer", European grocery discounter. Suddenly D'Or *is* derivative (a clone of Ghost Luminous, which is right up there with the Serges in terms of artistic creativity, obviously), but crucially it is exhilaratingly cheap! It smells as though it is worth at least £12.99, I'd say, so it's a keeper! I totally think Moroccan Oil shampoo could be a perfume also! Is it just me though or does it smell extremely similar to Le Male? Katie, I totally agree. Perfumes are so much about emotions and sensations to me that it would defeat the purpose to ignore that and wear the politically correct fragrance. I do enjoy reading about perfume and educating myself, so to speak, and broadening one's horizon is always good, but at the end of the day - or more to the point - at the beginning of the day when I face a long day where what I feel and sense is of relatively little relevance and what I do and *think* is much more in demand, perfume is what contributes to fulfilling my need to be more than thought and achievement. So, if a perfume can do that, then it's for me. And I want to pick from both ends of the scale, the "originals" as wells as the cheaper stuff - as long as my brain waves approve and I get a kick out of it. And Miss Dior Cherie and Un Jardin sur le Nil live very comfortably together in my perfume drawer. They get along very well and respect each other for what they are. And if one day an Amouage moves in that's fine. There's room next to Kenzo Summer and the Celine Dion I enjoyed so much a couple of summers ago. I agree with the spirit of this discussion, which seems to be "just be honest about what you enjoy without apology." For that reason, I'm gonna come right out and say that I like Mitsouko. Katie, I think I remember you saying once that it gave you too much of a "Babe Paley," feeling. But I like that. Also, Mitsouko reminds me of Chinese food? There's something edible in there, I just don't know what it is. I think I have a bizarro-sense of smell. 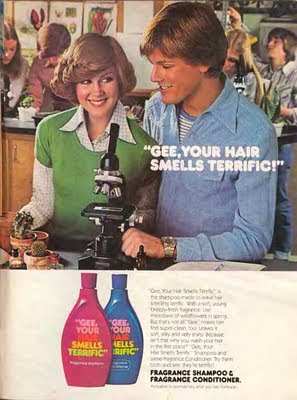 I also called Fracas "hairspray," but I meant the good kind that I loved smelling as a kid, not yucky stuff. I know that you mentioned once how much you like fruity-florals. Is Miss Cherie a fruity floral? Katie's video review for that fragrance cracked me up. "Look at her! Flying all over Paris! People can see right up her skirt!" One of the things I loved about when I did retail is when the older gents would come in with their wives and ask if we carried Canoe? (this was at Macy's.) Now, most of my compadres behind the counter would be rolling their eyes, but I always complimented their taste and then cheerily directed them down to the CVS Pharmacy nearby where it could be had for a solid tenner. One of my favorite things when I got into scent was discovering that the bottom row of the men's fragrances at my local drugstore had the good stuff - Canoe, Aspen, Halston Z-14, etc. I'd rather keep company with simple scents done right than have to wade through the hordes of club kids calling each other "babe" every 10 seconds while they slather Dolce & Gabbana all over their t-shirts. Maybe not exactly a "Sugar Sugar" kind of vibe here, but there's a good reason why Canoe can fit the bill when so many other, more hyperactively discussed and marketed fragrances come and go. I'm doused in Penhaligon's Lily of the Valley, which a certain renowned perfume critic with the initials LT has called "a horrible changeling," "crap," "failed," "something that belongs in a dispenser above the toilet and nowhere else" and about a dozen other epithets. I think I'm going to go put some more on....along with the matching body powder! Yay me! In your face, snobs! I loved L'Heure Bleue because it smells exactly like a long-lost children's shampoo I loved when I was seven years old. I remain a fan of I Love Love by Moschino, which is a knockoff of the ubiquitous Light Blue with more sugar. I don't think there's a point to wearing it myself, because I will smell variations on the Light Blue theme a few times a day anyways. Nora, personally, I don't think of Miss Dior Cherie as a fruity floral. It is sweet, for sure, but it doesn't have the pineapple, mango, melon or just plain juiciness of your typical fruity floral. It's more of a caramelly roundness and sweetness with a bit of patchouli. I've seen this described as a sweet popcorn note, but where I live we never, ever sweeten our popcorn, so I wouldn't know. MDC is one of those scents that just works so well on me, especially when spritzed in unscented body lotion. One of my colleagues complimented me on how good I smelled the last time I wore it that way and you could have knocked her over with a feather when I told her that it was MDC. She has daughters in their 20s and they've practically bathed in the stuf, and still she didn't recognize it. She described the scent as round and soft and slightly spicy. The latter is probably due to the caramelized sugar-butter note. I loved Katie's review of MDC :-) It *is* carefree and easy scent, but I know of few other fragrances that make me so happy when I smell it on my skin. It stimulates the happy synapses in my brain. And I will now officially join in the choir of moaners when it comes to reformulations, because reliable sources know that the new version lacks the popcorn note that makes MDC MDC. Boooh! I think Dior should stick with their story and leave MDC to float over Paris in her frivolous summer dress. That's how I like her. liam, my cheap and cheerful perfume joy used to be Love's Fresh Lemon, but the last time I wore it, it had lost whatever oomph it used to have. Vanessa, I'm cracking up at the name "Suddenly d'Or". Sounds like some very speedy alchemy was afoot. Jake, whenever I smell MoroccanOil products, it reminds me of Miller Harris Fleur Oriental, which is a Shalimar spin-off. I hadn't made the JPG Fleur de Male comparison, but that's just because I'm not as familiar with it. I think I might actually buy a bottle of Forever Sunshine body spray after a trip through Bath and Body Works today. I bought the shower gel and it's citrusy, creamy, and warm. I dig it. Junelady, I really like your observation that wearing perfume is engaging and satisfying for the right brain, giving it something to chew on while the left brain goes about its daily business. Marvelous! Nora, I just sprayed on my Mitsouko edt, and I know I'll get there with her someday, maybe in the pure parfum form. I always think of it having an oily quality - maybe that's your Chinese food. Stefush, so funny that you'd send potential customers down to the drugstore. And really, some of those drugstore treasures aren't necessarily simple, but they are done right. Yay you, Elizabeth! Sounds like (as one of my clever commenters once put it) you're taking a Chinchilla bath in the stuff. oksana, always a bonus if you can count on a bunch of other people wearing a common-yet-pleasing smell, so you don't have to. Elisa, that is a good idea! My contribution: "Kate Moss Kate is my L'Artisan Parfumeur Voleur de Rose"
Junelady, so glad I you were tickled by my Miss Dior Chérie review, especially as it's your "happy smell" perfume. From what I can tell, the reformulated MDC has lost the strawberry. Maggie, I'd be interested to hear if the Bath & Body Works body spray is as satisfying as the shower gel. Sometimes, the cheap spray stuff smells...cheap, and the shower gel or lotion hangs together better. Katie, I think your review was lighthearted and fun and a bit satirical and that's a good thing. MDC is obviously not for you, that's fair. We like different stuff. No point in discussing fragrances if we all liked the same. It's part of the fun to read someone elses take on what you like. And I'm old enough to cope with the fact that there are people out there who think MDC is no better than rolling one's body in candy floss and calling it perfume - just means more MDC for me. Yes, it's the strawberry that's gone. It's a pity. Some have likened the new MDC to a wannabe Coco Mad - and that seems totally pointless to me. Cherie means something like sweetheart and strawberry probably contributes a great deal to that sweetheart quality. It is my "happy smell". Hope I can find something that will do the same once the old MDC is no longer available. When I did send folks down to the CVS, I'd tell them to ask the clerks where the fragrances were and that Steve From Macy's sent them. They'd come back all a-flutter and say how nice the "CVS Boy" was to them and how he walked them over to the aisle, etc. Stefush--that's great! I'm sure they appreciated how nice you were. Junelady, I've not heard/read confirmation that MDC 2005 is being phased out - do you have any intel? I need to get to the bottom of this. It does seem ominous that MDC 2011 doesn't have any indicators that it's a flanker, though, what with it being called MDC with no qualifying suffix, ie "MDC Coquette", "MDC Career Lady", "MDC I'm Not Really a Waitress". Steve from Macy's - and now your soubriquet is known from Hollywood to Denmark! Katie, I went to a perfume counter here in Denmark today and asked about it. They had removed all their 2005 MDC's from the shelves and were waiting for orders to send them back. All they had on display was the new one with the paper label on the bottle and and the smaller print. I smelled them both side by side and the strawberry is most definitely gone from the 2011 version and it's worse off for it. What's left is a fairly inoffensive but also rather dull patchouli-ish scent, not entirely unlike Coco Mad, but not as good - and I have never been attracted to CMad. The new MDC is not something I will wear - it lacks personality, something that makes it stand out. Whether one likes the old MDC or not, it is at least easily recognizable. The new one could be named "MDC I'm not really that interesting" or "MDC I'm really a Coco Mad wannabe". I'm being mean, but this is the first time I've been hit personally by The Reformulation and clearly I'm not taking it well. So, at least on the Danish market it seems quite clear that the 2005 version is going down. I therefore assume this will be the case elsewhere as well. Personally, I'm trying to decide what to do: Bulk buy or accept this as another change in life and enjoy what I have left. Do you know of any fragrances that have the strawberry caramel softness of MDC 2005? I am SO laughing at "Disappointed!!" It's my new catchphrase, because there are so many situations where it's appropriated, unfortunately. Wow, that's some discouraging news about MDC 2005, because it's the ultimate version of that kind of fruitchouli fun pop. For patchouli berry caramels, I know of the following: Juliette Has a Gun Lady Vengeance, Kat Von D Sinner, Bond No. 9 Chinatown, Hanae Mori Butterfly (though that has a Windex note I find disturbing), YSL Belle D'Opium. Kevin Kline is in my opinion a very good actor and did a great job at playing Otto - glad you enjoyed it - that particular line ressonated with me from the very first time I saw the film - in certain situations that's the only adequate and honest response I can come up with. And what's so endearing (well, almost) about Otto is that's he's clearly trying to be open about his feelings. He's learned that. In anger management class. That could be the only thing he picked up. There's an Otto in all of us at times. I have Lady Vengeance - a rather new purchase that I haven't used much yet, but I enjoy it - rose and patchouli are good together - particularly, rose does patchouli a huge favor, I think. I'm not familiar with the rest of them, but that can be helped. Thanks for the suggestions. Oh, but the Windex note is SO much more prominent in Tocade! The new Angel flanker for summer also smells like a CocoMad wannabe. I love Kevin Kline. I think Soap Dish is one of the most underrated comedies of all time. Is the Windex connection why you link Tocade and Butterfly, Elisa? Junelady and Elisa, I can understand fragrance companies wanting a bite of Coco Mlle's market with their me-too scents, but it seems Miss Dior Cherie already has its own dedicated customer base. I don't understand anything anymore. I mostly link them because they're both very sweet and very pink. But on me Tocade falls apart (into Windex) after 10 minutes or so, whereas Butterfly lasts a long time and has a really lovely woody drydown (with not a lot of patchouli). Good comparative analysis. Thanks for sharing your data, E.
Junelady--this could be EU restrictions that the US market isn't or won't be subjected to. I love my "shampoo" fragrances. I refer to that part of my collection as my "cloaks of invisibility," perfect for occasions when you want to soothe and reassure those around you, rather than challenge them with your brazen audacity. My current favorite is Bond No. 9 Fire Island, which almost immediately transitions from "sun tan" to freshly washed, still damp hair. Gendarme is an old standby "cloak." A friend once referred to it as the scent of clean boy. And I even have a bottle with a dupe of Downy April Fresh mixed with perfumer's alcohol for when I wish to have absolutely no presence whatsoever. The Stealth Bomber of fragrance. Just try and find me. rkf, that is a fascinating concept, "cloaks of invisibility"! "Everything's all right, m'am, just keep moving! Nothing to smell here."